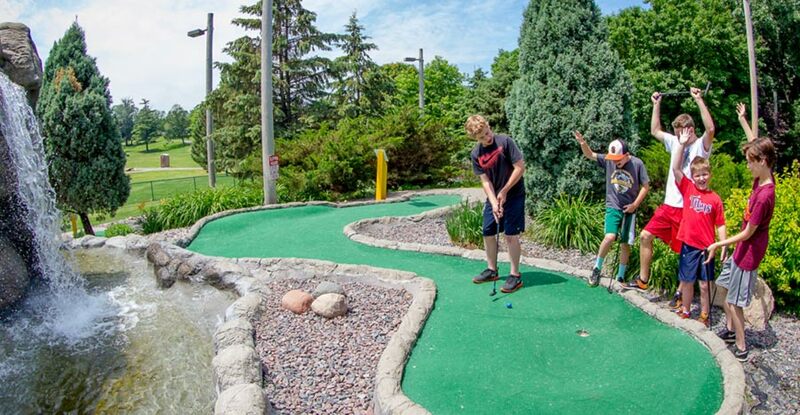 Adventure awaits on our Malt-T-Melt miniature golf course. It's so much fun you just might have to go for round two! And don't forget to grab snacks and refreshments at the malt shop. Our golf course is currently being renovated. Our brand new course of fully renovated 18 holes will be open May 25th! Below reflects the new pricing. Bring your friends and family out for a day on the putting green! This mini golf course is the right mix of playful and challenging. It boasts a 18-hole mini-golf course, surrounded by gardens and beautiful landscaping. Will you be the one to score a hole in one? This fun outdoor activity is great for all ages and occasions, especially for kids birthday parties, field trips, church event, or sports team party. Hungry putters can also grab food at the malt shop which serves melts and malts.